Mount Shasta, Trinity Divide and Scott Mountains from Cory Peak. Despite being blessed with rugged peaks, unusual but scenic geology, a fine compliment of lakes and meadows and relatively easy access, the Scott Mountains remain one of the lesser known ranges in the Mount Shasta region. The reasons for the range’s obscurity are many, but chief among them are simply being overwhelmed be the presence of Mount Shasta. 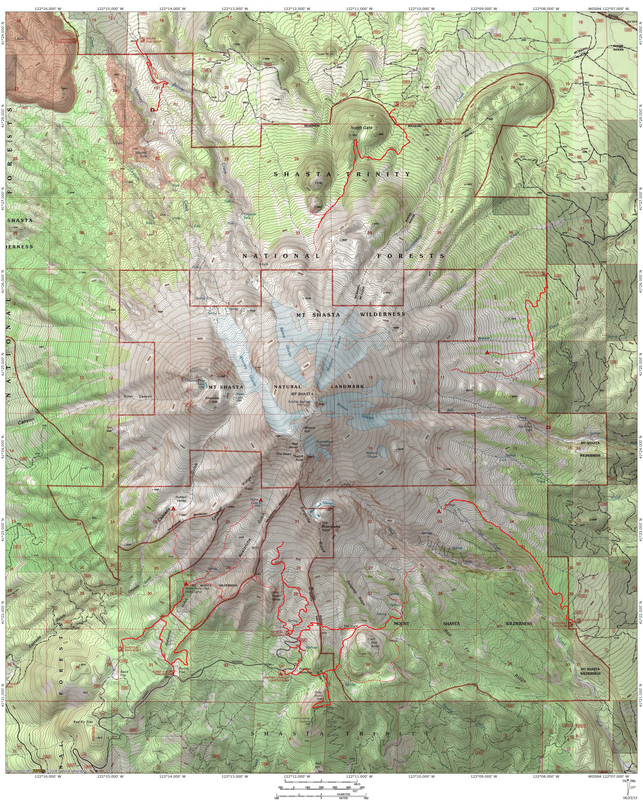 Add to that the great beauty of the nearby Trinity Divide and the Divide’s exceptionally easy access from I-5 and it is easy to understand how an entire mountain range could go unnoticed. Adding insult to injury, some of the finest portions of the Scotts, located in the mountains’ western half, were added to the Trinity Alps Wilderness, causing many to (understandably) associate them more with that giant wilderness area than with the Scott Mountains as a whole. Even though the Scotts have suffered the indignation of being broken up and overshadowed by the glory of Mount Shasta (really, what isn’t? ), the mountains still beckon to hikers. Those in search of alpine beauty and solitude will find these things in the Scott Mountains. Bluff Lake and High Camp Basin. The Pacific Crest Trail winds over 100 miles through the mountains to the south and west of magnificent Mount Shasta. While much of the trail passes through remote country with difficult access, a significant amount of the PCT is used by hikers and backpackers on shorter journeys than the one undertaken by through-hikers (those traveling the PCT’s entire length from Mexico to Canada). This is particularly true of the PCT as it passes through the Trinity Divide. 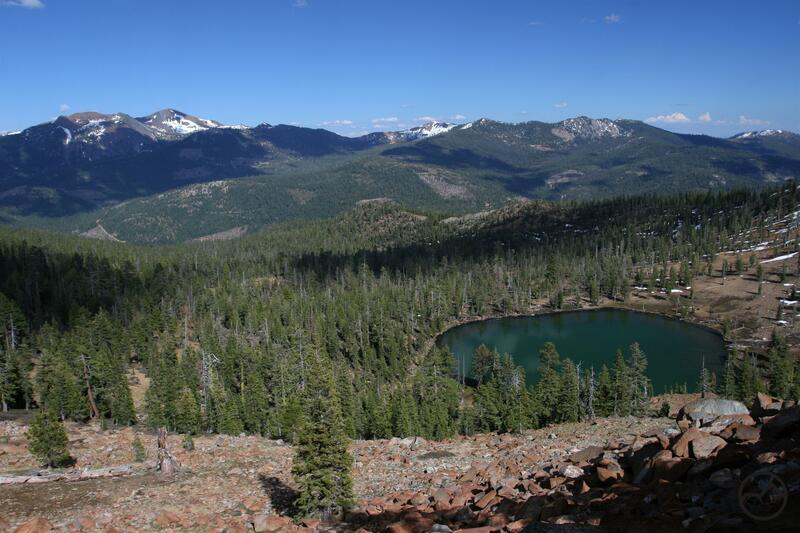 Many of the most popular hikes in that area, such as the Deadfall Lakes, the Seven Lakes Basin and Porcupine Lake are all reached via scenic hikes on the PCT. The same potential exists in the Scott Mountains but surprisingly few hikers take advantage of this excellent opportunity. 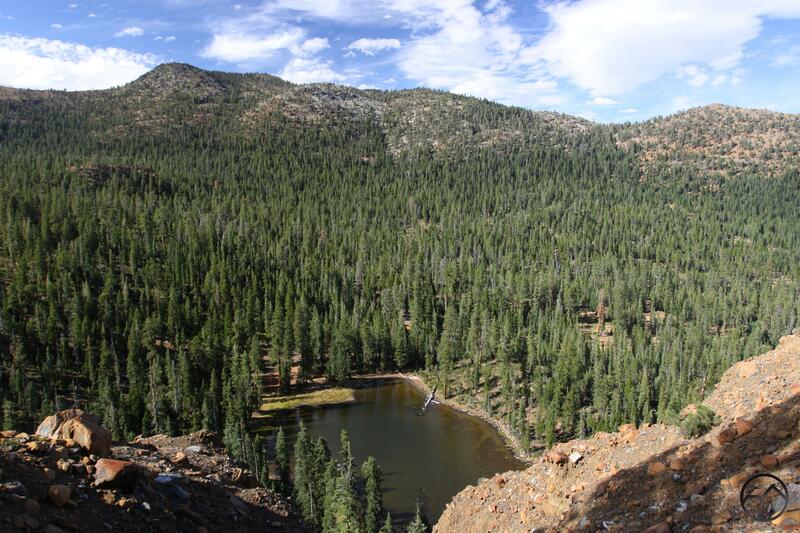 In particular, two sections of the PCT offer wonderfully scenic hikes to two fine lakes. 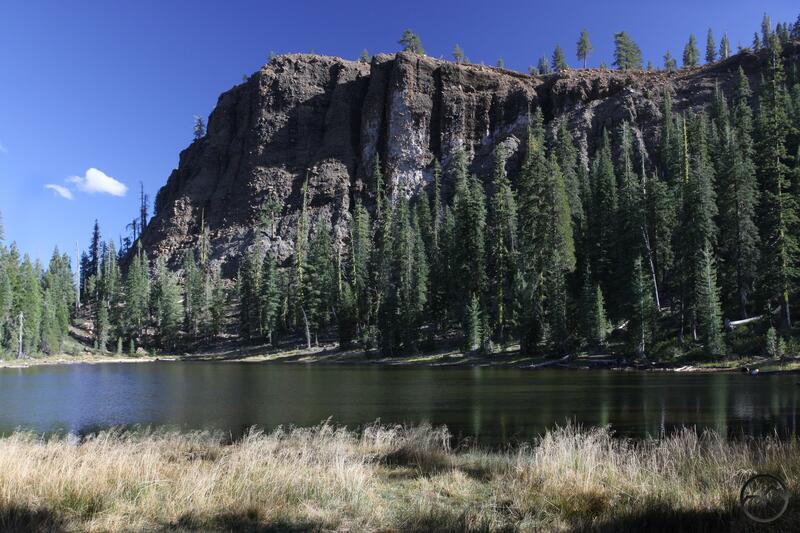 With easier access from Mount Shasta, Bluff Lake is small but very attractive and has the bizarre Cement Bluff looming overhead. In contrast, Bull Lake is nestled in a shallow, barren basin but is much larger than Bluff Lake. Both sections of the PCT are also complimented with great scenery for the duration of the hike, including excellent views, meadows, small tarns, and the ubiquitous red cliffs that are the hallmark of the Scott Mountains. These two segments of the PCT are reached by paved roads, making access incredibly easy. In spite of the aforementioned causes for the Scott Mountain’s obscurity, it is still a surprise that they continue to go unrecognized by hikers. Perhaps the reason for this is the paucity of developed trails aside from the PCT. What few developed routes there are receive little maintenance and some have faded away entirely. No hikes in the Scott Mountains are mentioned in hiking guide books, burying them deeper in anonymity. Still, they are too beautiful mountains, too unusual and too easily accessed not to be taken advantage of. Hikers who do will enjoy the beautiful lakes, meadows and cliffs alone, seldom intruded upon by others on the trail. Cement Bluff and Bluff Lake. The hike on the PCT to Bluff Lake is as scenic as it is easy. 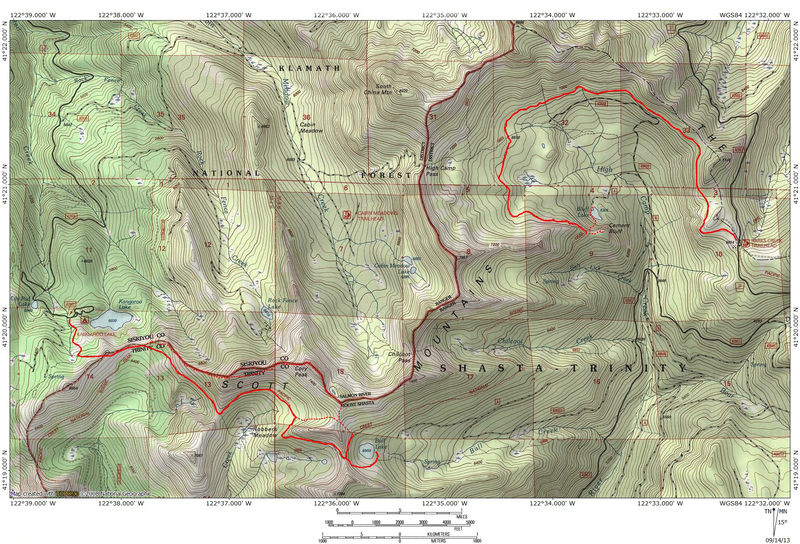 The trail maintains a level course for 4.5 miles as it makes a nearly complete encirclement of remote High Camp Basin. The basin is the northernmost headwaters of the Trinity River and is surrounded by peaks over 8,000 feet and high cliffs composed of stark, red peridotite. The trail initially traverses along a cliff high above the east side of the basin. Views to the west, particularly of rugged High Camp Peak are great. The unusual formation known as the Cement Bluff stands out against the dense forest. Soon the terrain levels out as the PCT rounds to the north side of the basin, beneath China Mountain and South China Mountain. Eventually passing through park-like forests with swaths of meadow, the trail continues to round the basin as it heads to the west side. Here tall cliffs rise high above and Mount Shasta and Mount Eddy are visible to the southeast. Near the end the path passes onto a bright red talus slope, winding its way through large boulders. 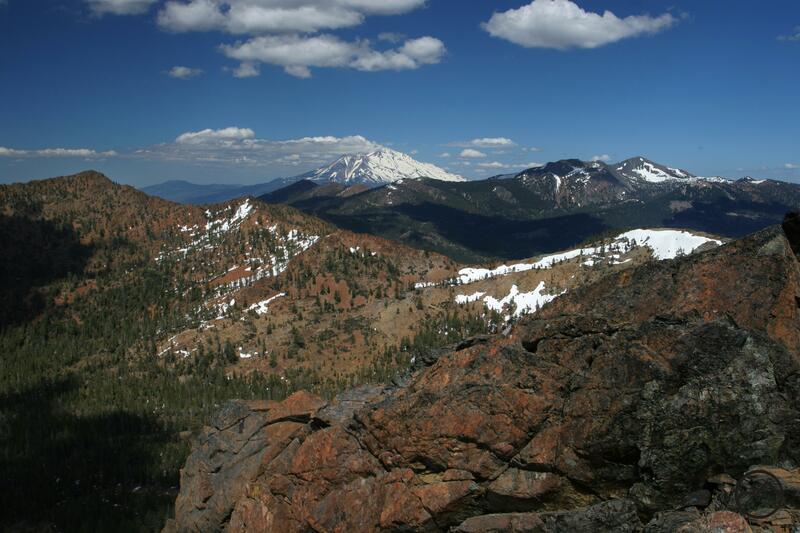 Great views of Shasta and Eddy are combined with an expansive view of High Camp Basin. Finally the PCT reaches a side trail that leads to the top of the Cement Bluff. There are great views of Mount Eddy and High Camp basin from the summit. Steep use trails lead down to small, meadow fringed Bluff Lake. The view of the unusual, aggregate laden cliff of the Cement Bluff from the north shore of Bluff Lake is not to be missed. The trip to Bull Lake begins at Kangaroo Lake, the largest body of water in the eastern half of the Scott Mountains. To reach the PCT, one must first climb up the Kangaroo Fen Trail, a short route ascends the cliffs on the west side of the lake. It surmounts the crest of the Scott Mountains and drops a short distance down to the PCT on the range’s south side. The climb takes hikers from the Scott River watershed into the Trinity River watershed. Once on the PCT, it traverses across a small basin with ponds and meadows down below before crossing into Robber Basin, a large bowl that is home to expansive Robber Meadow and small, hidden Robber Lake. Views of the Trinity Alps to the southwest are great. The PCT then crosses a large, red scree field before rounding a broad ridge and entering the basin that is home to large Bull Lake. The area surrounding the lake is surprisingly barren. The highlight of the hike, for those eager for a challenge, is the climb to the summit of Cory Peak and the small tarn near the summit. The small turquoise lake is set against bright red rock, just below the summit of the rugged peak. The view from the top is incredible, taking in Mount Shasta, the Trinity Divide, the Scott Mountains, Russian Mountains, Marble Mountains and the jagged Trinity Alps.